Research Søren Rasmussen & Anders Thygesen. On 27 of December 1941 at 08:40 pm a Whitley with the identification number Z.9125 from the Royal Air Force took-off from the Stradishall airbase in England. It was piloted by Sgt. Jones and 2nd pilot Sgt. Gold. Apart from its payload of four 250 pound bombs the plane carried a package in a parachute containing assorted equipment for the first Danish S.O.E. (Special Operations Executive) agent’s team to set foot on Danish soil: Chilblain I & II. The agents were Carl Johan Bruhn and Mogens K. A. Hammer. The airdrop which took place at Haslev in South Zealand should have been the spear head for S.O.E’s future operations in Denmark and was code named “OPERATION CHILBLAIN”. Carl Johan Bruhn was selected as chief of S.O.E. in Denmark while Mogens Hammer in his capacity of being a telegraph operator should establish the communication line back to England. On 27 of December 1941 at 09:00 pm 2 inches of snow covered the landscape, the temperature was -7.9¢ª Celsius (17.7¢ª Fahrenheit) and the wind was North East 7-8 m/s (15-17 miles per hour). It was moonlight but with clouds drifting across the sky, making navigation difficult especially in altitudes below 2000 feet. As a diversion they flew to Masnedø at Vordingborg but their first approach towards the target failed and Sgt. Jones decided to try once more. At their second approach they were successful in dropping four bombs from a height of 1000 feet. One of the bombs detonated on a field and another impacted close to the railway tracks only 150 yards from the transformer station. Unfortunately no significant damage occurred and the last two bombs failed to detonate. 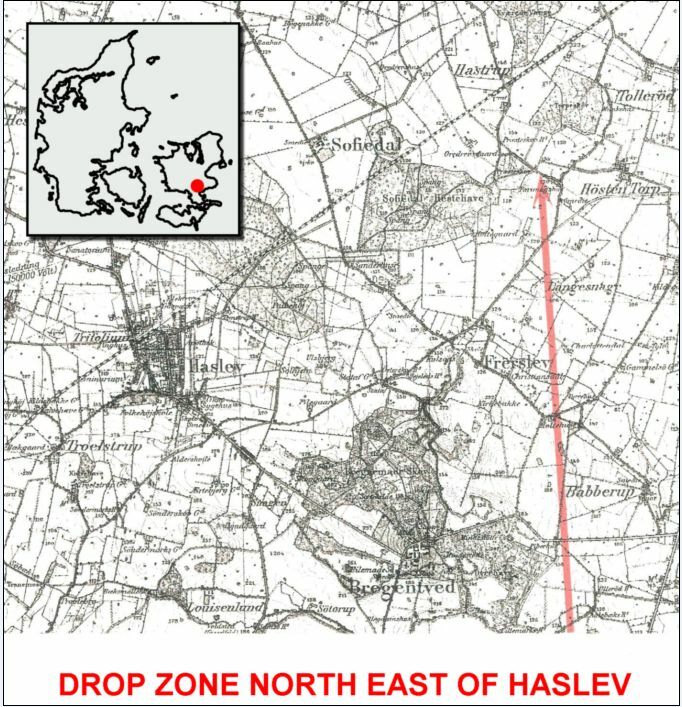 The rear gunner signed off by firing four bursts from his machine guns at the target and then the Whitley headed out for the primary objective of the mission, the drop zone North East of Haslev. The plane circled a couple of times around the church in Freerslev approximately a mile south of the drop zone and then continued towards Torpeskov, to complete the mission. The drop which took place from an altitude of only 500 feet was “blind” which meant without a reception of Resistance fighters. Carl Johan Bruhn had expressly ordered a “blind” drop. His graduation in forestry in this particular area (Bregentved Gods) made him extremely familiar with the territory. He also had some personal friends that he could call upon. According to Mogens Hammers personal account, told to his brother Svend Erik Hammer, and an interview to the Danish newspaper Berlingske Tidende from 7 of August 1945, Carl Johan Bruhn was the first to jump followed by the package and then Mogens Hammer. Needless to say but from that height the luxury of carrying a reserve chute was not an option. Unfortunately Carl Johan Bruhn’s parachute failed to open as the snap hook on his static line came away from its anchorage point inside the aircraft and instead followed him to the ground. It was known that cable static lines had a tendency to "whip" but it had never been foreseen that the result of behaviour could possibly cause the static eye-splice to part from its anchorage point. As a direct consequence of this accident all snap hooks are to this day fitted with a locking device. In the cause of nature Carl Johan Bruhn was instantly killed when he hit the ground and with that the first attempt to establish an S.O.E. operation in Denmark. Mogens Hammer who landed safely found the body of Carl Johan Bruhn within an hour. Searching the body he salvaged the papers and money required to proceed with the operation. The money was hidden in Bruhn’s boots so he had to cut these open to get to it. Needless to say it was a very unpleasant experience for Hammer, especially as they had become good friends during their training. Mogens Hammer managed to slip away unobserved. The next morning 28 of December 1941 at 10:00 am the temperature was -13.6¢ª Celsius (7.5¢ª Fahrenheit) and the wind calm. The purple parachute connected to a suitcase was soon found by local farmers at the field of Holtegaarden next to Hostentorp. Unfortunately they failed to keep the information to them selves but notified the Danish police. Close by, a little north of there, the body of Carl Johan Bruhn was found still wearing his unopened parachute. The yellow static line still attached to the chute pointed towards south. Carl Johan Bruhn's wristwatch had stopped at the time of impact showing 02:05 am. Next to him was found a canvas packet with 12 automatic pistols (unfortunately the report fails to establish the type) inside along with ammunition and a folding spade. The suitcase contained a radio telegraph transmitter, a grey rucksack containing civilian clothes and a white rubber package with a most unusual agent “tool” never seen before. We have only succeeded to find one official document from the War Office that confirms its existence and in this particular document dated 6 of March 1942 it is referred to as the "Remote Control Pistol". Despite its official name in the following text we chose to call it the Cable-pistol. Es handelt sich um eine überaus gefährliche Gangsterwaffe, die - soweit bekant - erstmalig von feindlichen Nachrichtendienst eingesetzt worden ist. Translated: "What we are dealing with is an extremely dangerous gangster weapon, which - as far as we know - originates from an enemy intelligence service". The report was the direct cause for changing the restraining procedure. The decision of declaring an arrest by laying a hand on the suspects shoulder was immediately repealed. We found the report in the Danish National Archive and it now forms the foundation for this article. The system allowed the agent to fire one or more shots from the hip if he was about to be arrested. This even if he was ordered "Hände Hoch" ('hands up'). The whole apparatus was attached to the waist with the standard English model 1937 army belt. A single suspender strap attached to the belt in front of the plate mount assists in keeping the muzzle of the pistol pointing horizontal. We are aware of two different versions both using the COLT Hammerless 1903 .32ACP caliber pistol subsequently referred to as Mk.I & Mk. II. The one found on Carl Johan Bruhn named Mk. I and the one produced by John Wilkes from the Wilkes Bros. gun shop in Soho, London named Mk.II. The photo shows the Cable-pistol Mk.I found on S.O.E. agent Bruhn’s body. Note the carefully crafted cover plate compared to the Mk.II version produced by Wilkes Bros.
Photo: Danske Politets Efterretninger 7 January 1942. Close up photo of the Cable-pistol Mk.I found on S.O.E. agent Carl Johan Bruhn’s body. Photo: Danske Politi Efterretninger 7 January 1942. In the Mk. I model one will notice that the cover plate is carefully bent and shaped to follow the pistols contours. The platform to which the pistol is attached is small and handy and the corners are curved leaving the impression of a professional production. The photo shows the Cable-pistol Mk.II produced by John Wilkes from Wilkes Bros. gun shop. Note the coarse-cut cover plate compared to the Mk.I version. Also note the cuts in the cover plate next to the magazine well making it easier to reload. Photo: Søren Rasmussen. On the Mk.II version the cover plate is flat, rectangular and disproportionately big which leaves the impressions of a hasty production. However we know that the Mk.I version was encumbered with problems. For instance the platform carrying the pistol being too small causing the pistol rig to be unstable during recoil and if the cable twisted the pistol would not fire. John Wilkes corrected these defects and the rig as a whole by making the platform bigger and made a modification to the trigger unit on the finger which allowed the cable to rotate freely without locking the trigger cable. 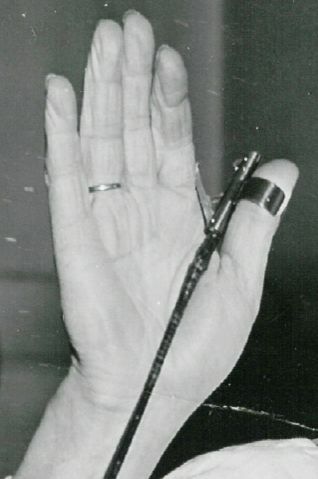 According to John Wilkes only 40 – 50Cable-pistols were produced. The Mk. I model was according to John Wilkes brought to the Wilkes gun shop by Major Ridout and Lt. Col. Tomlinson who requested that the gun be produced by John Wilkes. This information is rather interesting seen in light of newly released documents from the Public Record Office (PRO) in England. The book "SOE The Scientific Secrets", by Fredric Boyce and Douglas Everett, features a reprint of a document that was produced towards the end of the war to ensure that the right persons would be properly credited for their inventions. Among the entries on the list can be found: "Remote Control Firing Mechanism For Pistol". The inventors are listed as Lt. Col. J.R.V Dolphin and Mr. E. Norman respectively. We now know that Lt. Col. John Robert Vernon Dolphin was Commander of Station IX (The Frythe). Station IX busied itself with the research and development of weapons and gear to be distributed to the resistance movements in the occupied countries and Eric Norman was one of its foremost weapons experts. In that light it is tempting to draw the conclusion that the Cable-pistol was invented and further developed at Station IX only later to be handed over to Station VI (Bride Hall) being the weapons section and as such responsible for the further production. This is where Lt. Col. Tomlinson enters the scene. As chief of Station VI he approached John Wilkes with the aim of getting a proper production started, the result of which is the Mk II as we know it today. Photo: Danske Politi Efterretninger 7 January 1942. The trigger to the left is an unknown and maybe improved version of the trigger device. But it could also easily have been a first generation trigger. In our opinion it is a little too clumsy to have been the final product. 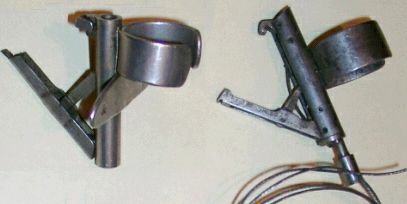 The trigger device to the right is shown with the inner wire from the Bowden cable attached. It is identical to the one found on Mr. Bruhns Cable-pistol Mk.I. 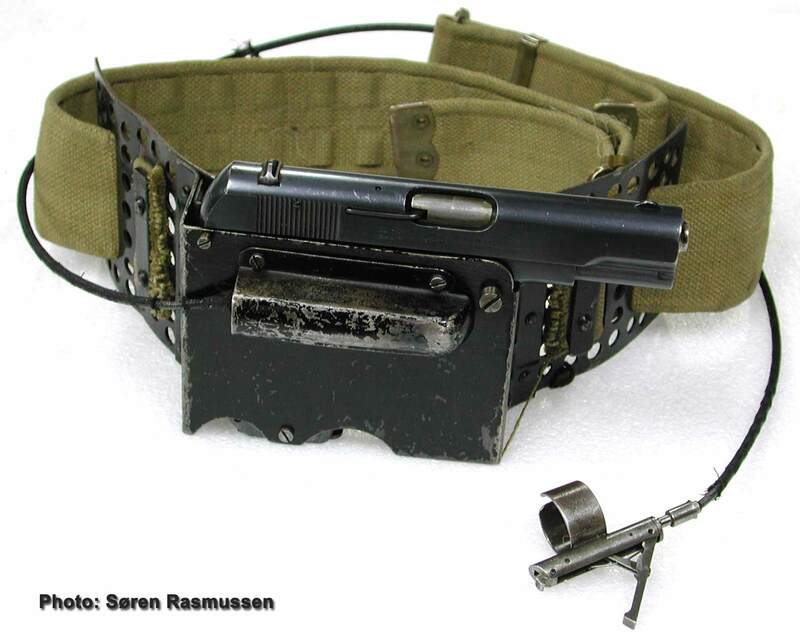 No one knows for sure how many Cable-pistols were used on missions, but it is certain that Carl Johan Bruhn and Mogens Hammer were issued one each for the Chilblain operation besides the one found in the rubber packing. The two Czechoslovakian S.O.E. agents who on 27 of May 1942 assassinated Reinhard Heydrich in Prague (Operation Anthropoid) were issued at least one Cable-pistol. It is doubtful if the gun was used from the rig but empty shells casings from one of the two issued Colt 1903 pistols were found at the scene of the action. The pistols have serial numbers #539370 and #540416 and according to Colts shipping lists they are both nickel plated. The pistols are now on display in the Prague Memorial Crypt. It has turned out to be very difficult to find any reliable information or evidence to prove the existence of the Cable-pistol. The only model in existence that we are aware of is on storage at SATIC (Small Arms Technical Information Centre) in Leeds, U.K. formerly known as the MOD Pattern Room in the Enfield Building in Nottingham, U.K. Unfortunately there is no access to the public. In 1980 the Imperial War Museum and the Pattern Room asked John Wilkes if they could borrow his original blueprints of the Cable-pistol which regrettably they failed to return. We enquired with both museums but neither could claim possession of the drawings! The biggest mystery is what actually happened to the Mk.I´s carried by the agents Carl Johan Bruhn and Mogens Hammer and the one in his luggage. We know that the two were seized by the German authorities but we haven’t been able to find them in any museums or archives in Denmark. It is possible that they were sent to Germany along with Mr. Müller’s report. After all this was a completely new weapon never seen before. The one carried by Mogens Hammer has never turned up either but witness reports reveals that he was wearing it in Copenhagen after his escape. The Museum of Danish Resistance 1940-1945, DK., The Imperial War Museum UK., The Ministry Of Defence/Pattern Room UK., and S.A.T.I.C. (Small Arms Technical Information Centre) UK. Cornish, Paul - Imperial War Museum. UK. Seaman, Mark - Imperial War Museum. UK. Sharrock, Robert, A. - Ministry Of Defence/Pattern Room. UK. Whitsey, Craig - Wilkes Bros. UK. Wilkes, John - Wilkes Bros. UK. Boyce, Fredric and Everett, Douglas - Special Operations Executive-The Scientific Secrets, Sutton Publishing, 2003. Brunner, John W. - OSS Weapons, Phillips Publications, 1994. Brunner, John W. - The COLT Pocket Hammerless Automatic Pistols, Phillips Publications. Clark, Freddie - Agents By Moonlight, Tempus Publishing Ltd. 1999. Eilstrup, Per & Lindeberg, Lars - De Så Det Ske Under Besættelsen, Forlaget Union 1969. Jespersen, Knud J. V. - Med Hjælp Fra England (Bind I): Odense Universitetsforlag 2000. Merrick, K. A. - Flights Of The Forgotten, Weidenfeld & Nicholson military 1989. Skennerton, Ian D. - De Lisle's Commando Carbine. Archives of The Museum of Danish Resistance 1940-1945, DK. Danske Politi Efterretninger 07 January 1942. National Archives/Rigsarkivet, DK. - Danica 203, Pk. 80, Læg 104., Danica 203, Pk. 51, Læg 636. Public Record Office, UK. - HS2/59.